I downloaded a new iPhone application for photographers (The Photographer’s Ephemeris) that overlays on a map where light pollution is minimized, as well as when the Milky Way is visible without a Moon in the sky. After a search, I found that Markleeville airport is a fairly nearby airfield in an area of “dark skies”. Using information on the Milky Way and Moon, plus a forecast of clear skies, I headed out for a night at Markleeville. I landed an hour before sunset, took a few photos, ate a simple dinner and bedded down in the plane. My daughter gave me an old Poco Pad (beefy air mattress used by white-water raft companies) and even though it doesn’t hold air any longer, it is extremely durable and I’ve found it perfect for laying down in the airplane over the seat belts and other protrusions on the floor of the plane. The center of the Milky Way was forecast to rise at 11:45 pm while the Moon was forecast to rise at around 3:00 am. I got up at 12:30 am for two hours of playing around with the camera. 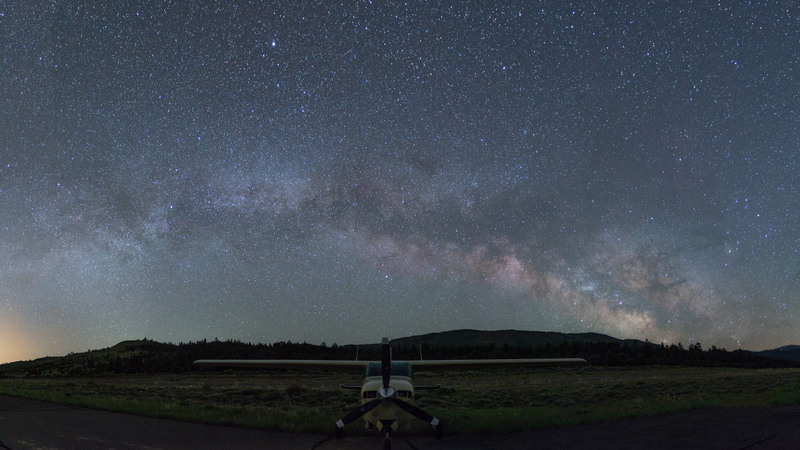 The Milky Way shot is five or six shots stitched together. The light area at the left is the lights of Minden/Gardnerville or maybe even Carson City/Reno. The star trails shot is composed of eight shots of 7 minutes duration each, overlaid to show the longer star trail. Anyway, this was a fun trip, though I don’t plan to do it often, or maybe ever again. Its also nice to sleep through the night. Edit – I’ve been asked for more details on how I got that shot. It is five portrait wide angle shots stitched together in Photoshop. Camera was a Sony a6500 with a 16mm Sigma lens. Each shot was taken at f1.4, 20 seconds and ISO 1000. I read that anything longer than 20 seconds you start to blur the star points with movement of the earth. To get even more technical, apparently parallax is a problem if you have something in-close like an airplane in front of you as you swing the camera for each shot. So I used an “L Bracket” thing which allows the camera to swing around the focal point (about mid point on the lens) , not the tripod mount. My brother-in-law Ron is going to split this photo down the middle and try to use them as backgrounds on his two-monitor set up at work. I don’t have that set up but it sounds very cool. If you want to do this, here is a link to the full res file – about 10,000 by 6,000 pixels and whopping 42 MB. Great story – might just need to do the same, but I’ll bring a tent – looks like BLM land, so should be able to camp under the wing. Actually there are some very nice unimproved campsites there with good fire rings – although RVer’s can get in there and sometimes take the good ones. Have biked into that strip to check it out but never flown in. Have wanted to do a flying/biking trip there but haven’t managed it yet. Maybe you’ve inspired me. Beautiful photography. Thanks for sharing, Ney! Amazing how much fun you can have just a few minutes from placerville by air! Thank you Derek. Good to hear from you. I hope things are going well for you! Once again, we’re on the same wavelength. I did a similar trip with my 182 a couple of years ago. In SoCal, I had to fly out to the Mojave. Stovepipe Wells in Death Valley is good, but the last time I flew out to the Bacon Strip which is a private desert ranch strip (just a dry lake bed, really) near Baker, CA, but the owner will let anyone land if you just email him a heads-up. I assume you checked out lonelyspeck.com? This guy Ian has tons of great tips for photography like this. I will try to post a couple of links to some photos I took. Awesome photos New, would love to see the higher res versions on your blog. Maybe they type where you click on the image and they expand to “full-screen” or whatever. I’m not really sure how this blog stuff works but I always enjoy reading yours! Man, I thought my blog did that already – able to blow up photos. I can’t believe I didn’t figure that out. I did now figure it out, and have gone back for the past few years and enabled that, photo by photo. I will send the full res version to your email. Enjoy.